Hamby Home(in)stead ...: Free firewood! For us, moving to South to Victoria represented a 1,000km change in climate. It is definitely much colder here than what we were used to. Fortunately Hamby Home(in)stead has a combustion fire in the lounge area, which we started using as early as April! As winter approached we used the wood heater more often - and cutting/collecting firewood was a regular activity. There was a fair bit of wood stored in the back corner of the house paddock but it was obvious we would need more. The Victorian Department of Environment and Primary Industries allows the free collection of firewood for domestic use during an autumn (1 March to 30 June) and spring (1 September to 30 November) at designated areas in certain State Forest areas. 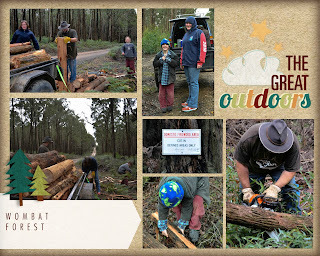 It was nearly the end of the autumn collection period that we visited the local-ish Wombat Forest to try our luck. Quite a few people had obviously been luckier than us, earlier in the season. Even so, we took home a very full trailer-load to supplement our pile. (Due to recent rain, most of the wood was quite wet and wouldn't burn well - but will dry out in time). All going well, we intend to collect more wood during the spring season to prepare ourselves better for next winter. Although I helped with the wood collection, I also took the opportunity to photograph some lovely fungi that were spotted during the day. I've just now found information about a fungi guide for the local area, so may purchase that for future reference! It was quite a cold day but we enjoyed our first trip to Wombat Forest. It may be that we can explore further on another occasion, praps even camp there - worth investigating, for sure.